The husband and wife cabaret team of David Alpher & Jennie Litt provided an afternoon of entertainment and education in their show The Elegant & The Immigrant: Cole Porter & Irving Berlin Together at Don't Tell Mama. Vocalist Ms. Litt's deep emotional engagement with the work of these two giants was on display throughout, as was Mr. Alpher's tasteful, unobtrusive piano work. While the lives of the two composer-lyricists could hardly have been more dissimilar, the work they produced both reflected and enhanced the great American melting pot in the heyday of its unchallenged ideological supremacy. The pairings of the songs were thoughtfully chosen to suggest how two starkly different sensibilities reacted to the same raw material--- the fundamental promise and abundance of America ---- and could turn out masterpieces, utterly different, yet rooted in a characteristically American desire to express the freedom to explore seemingly limitless possibilities . Ms.Litt's strong, heartfelt, yet never exaggerated, performances compellingly captured the joie de vivre inherent in songs like “You're the Top,” Cole Porter's dizzyingly admixture of high and popular culture ----long before the postmodernists made it a cultural crime not to mix and match---- was gamely paired with Irving Berlin's still-fresh classic "There's No Business Like Show Business." America's unprecedented, and uniquely successful assimilation of Jews was demonstrated in Berlin' s jokey trafficking in anti-Semitic stereotypes in "Cohen Owes Me Ninety-Seven Dollars"--- a precursor, perhaps, of the manner in which some of today's black comics banteringly toss around the " N word." That Berlin, the Jewish immigrant who, as a matter of course, had to change his name to make it in show business, ultimately became confident enough in America and his place in it, to pen this tune is a triumphant tale in itself. Cole Porter's complex emotional life as a gay man married to a woman was perhaps treated a little less forthrightly, although its being mentioned in a casual, off-handed manner should probably be understood as a real sign of a measure of progress that was once unimaginable. This joyous afternoon show, which was directed by Lina Koutrakos, whose occasional backdrops were mood-enhancing without being gaudy or distracting , is sure to stimulate or re-awaken interest in the songs of Irving Berlin and Cole Porter. I imagine that it will also send a few curious listeners to the bookshelves for biographies of these musical geniuses, who wrote so many enduring masterpieces that have come to represent America and its music at its best. I wondered, during the course of the show, if Cole Porter and Irving Berlin had ever met in person. Well, if they never met in real life, David Alpher and Jennie Litt did a masterful job of introducing them, and in doing so also provided a great template for other pairings from the Great American Songbook. Filled with imagination, non sequturs and joie de vivre, this lively album is uplifting in its originality and intelligent word and music play. The titles alone say the most about the fun husband and wife David Alpher (composer and pianist) and Jennie Litt (lyricist and singer) are having writing and performing their own interesting songs — "Hot," "I Want to Be a TV Chef," "Christmas in the Doghouse" and "Thong Song." Such ditties are clever, witty and timely. Whether they are appealing to everyone is a matter of taste. The duo work well together and it shows. Their songs, like their voices, don't always compel or jump out at you. Yet, the same may be said of the prolific Dave Frishberg, who seems to be an influence. And, that's not a bad thing. But it can make it harder to reach a wider audience. Alpher & Litt are committed to their work and obviously have an admirable intellect and flair for fun. This is particularly expressed in their ever-amusing cut, "Two Apples." It's a unique metaphor on the good, the bad and the ugly in life told through the earthy, sophisticated and whimsically perceptive tale of two apples (Rosie and Blanche) from the same tree. One is carefully plucked by a respected, selective chef to do great things and is served to an elite client. The other falls to the ground, becoming a pile of mush in a garbage bin and devoured with delight by a wily old rat. This complex use of extended wordplay is masterful on many levels. The poignant moral is subtle amid all the biting innuendos about the fate of the two apples: "... who's to say what things are great things?/Are they only things that fate brings? "Going Nowhere Fast," about an obsessed gym guy, begins as a mix of frenetic funny stuff and leads to a trenchant end: "...love each moment of the journey"; and "Hello in There" becomes a moving lullaby with a gentle message to a baby. It's eclectic material. And this duo make it work with urbane wit and heartfelt, life-affirming essence, using their soft style that never loses the message. It's the expressive words and unobtrusive music that permeate this sometimes quirky, sometimes indulgent, sometimes brilliant compilation of story songs from a talented writing team. 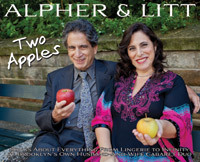 Cabaret singers looking for new, unusual material should check out Alpher & Litt. Alpher and Litt Light Up the Met Room...with Guests! 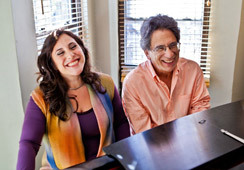 The singing/songwriting team of David Alpher and Jennie Litt have been causing a major stir in cabaret for at least the last season, and rightfully so; their most recent outing at the Metropolitan Room showcases the duo as a force with which to be reckoned. It certainly doesn't hurt that the legendary Boots Maleson accompanies them on bass, or that Scott Neumann comes forward on percussion, plus Marcia Young on the harp, but the combination of Alpher's sensitive touch at the piano and Litt's innate abilities as a vocalist are only enhanced by such a vibrant combo. And this is only further heightened by such guest artists as Drew Minter, Rosemary Lear, Lina Koutrakos, Araina Collazo and Adam Shapiro coming forward to participate in the delectable parlay. Songs from their recent CD "Two Apples" are displayed herein in utter splendor. These include "You and Your Big Nose" with a vocal by Litt, besides "Public Transportation" and "The Cosmic Perspective." There's also a performance by Loar on the song "Hot!" which completely raises the roof, the brilliant lyrics on "The Voyage of the Manatee" as sung by Adam Shapiro, which gave him more than just one chance to shine, and most certainly "Thirty-Two Bars" as voiced by Koutrakos, which completetly tears the house down. Minter equally displays a most incredible vocal range that reaches from baritone to countertenor on such numbers as "Who Cares?" and "The Harper's Life." And Collazo raises the roof with "Hello In There." There's nothing much left to say except that David Alpher and Jennie Litt are headed for big-time cabaret. Jump on the bandwagon, purchase their CD, and hang on for the ride. These two are going places. Imagine that you spend your first date singing the Great American Songbook, get married, and then write your own songs. That's what Jennie Litt and David Alpher did. If they have a favorite tune among them, they're not saying. Litt had been singing and writing since junior high and Alpher was an acclaimed composer and pianist in the classical music field when they met at The MacDowell Colony in the woods of New Hampshire. They soon became a team, merging their professional and personal lives. The show's title derives from a line in "Hello in There," written as a heartwarming welcome for a daughter. Other songs aimed at the younger set include "Two Apples," a poignant cycle-of-life song about Rosie, a bright red apple that occupies the same branch as Blanche, a pale pippin deprived of sun. The show is largely their songs. Alpher's music is finely crafted and Litt's rhymes are funny and clever. "I Want to Be a TV Chef" has the line, "Bobby Flay at the grill gives my flank steaks a thrill," and there's "Like a Berlin tune about the moon" in "Your Standard Standard." They included standards such as "Can't Help Lovin' Dat Man" and "Isn't It Romantic?" Accompanied exceptionally well by Alpher on piano and Ritt Henn on bass, Litt sings with humor and genuine warmth. Songwriting team Alpher and Litt brought their show, Composing Ourselves into Metropolitan Room in Chelsea, for several shows in January, 2011. The show was directed by Barry Kleinbort and the musicians were: David Alpher, pianist and composer; Ritt Henn, upright bass and Jennie Litt, singer and lyricist. The songs were mostly light and witty, and delivered in a professional manner. Jennie is a good singer and storyteller, while David has fine musicianship and obvious rapport with his wife. The set mainly consisted of their originals, but a few standards were included. They began with an original "Your Standard Standard," where the lyrics were making fun of the Great American Songbook. David and Ritt played easily together, putting in a beguine beat. This was followed by Rodgers & Hart's "Isn't it Romantic." Jennie's voice is in mid-range, pleasing to the ear, with good intonation and a nice vibrato. The songs of Litt and Alpher are different from the run-of-the-mill pieces. "Two Apples" had cute lyrics — a story of different apples growing on the same branch — and the music contained a strumming rhythm; "Thong Song" was an amusing story — a bit risqué about women's clothing. Jennie's patter about catering led into "I Want to be a TV Chef," which had great rhymes and made the audience laugh out loud. "Hello in There" was an emotionally delivered ballad about their 2 year-old daughter Mirabelle (David had composed the music while a student at the BMI Musical Theatre Workshop way back in 1974! ); and "The Voyage of the Manatee" was another cute story done in 6/8 time with beautiful piano accompaniment. At this point, they inserted the familiar standard, "Can't Help Lovin' that Man" and even though the audience knew the song backwards and forwards, it was a pleasure to listen to Alpher, Litt and Henn's version. The remainder of the set had three more original tunes. "Going Nowhere Fast," whose gist was 'one must live each minute as if it were your last.' "If I Were," a simple song about love from various perspectives, and the encore "The Cosmic Perspective," a thought-provoking tune with a catchy waltz melody. Altogether, I enjoyed the songs by Alpher and Litt, as it was a fresh relief of honesty and fun in this hectic world.